The C-C motif chemokine ligand 16 (CCL16) is a potent pro-inflammatory chemokine and a chemoattractant for monocytes and lymphocytes. In normal plasma, it is present at high concentrations and elicits its effects on cells by interacting with cell surface chemokine receptors. In the European rabbit and in rodents such as mouse, rat and guinea pig, CCL16 was identified as a pseudogene, while in the thirteen-lined ground squirrel it appears to be potentially functional. To gain insight into the evolution of this gene in the superorder Glires (rodents and lagomorphs), we amplified the CCL16 gene from eleven Leporidae and seven Ochotonidae species. We compared our sequences with CCL16 sequences of twelve rodent species retrieved from public databases. The data show that for all leporid species studied CCL16 is a pseudogene. This is primarily due to mutations at the canonical Cys Cys motif, creating either premature stop codons, or disrupting amino acid replacements. In the Mexican cottontail, CCL16 is pseudogenized due to a frameshift deletion. Additionally, in the exon 1 (signal peptide), there are frameshift deletions present in all leporids studied. In contrast, in Ochotona species, CCL16 is potentially functional, except for an allele in Hoffmann’s pika. In rodents, CCL16 is functional in a number of species, but patterns of pseudogenization similar to those observed in lagomorphs also exist. Our results suggest that while functional in the Glires ancestor, CCL16 underwent pseudogenization in some species. This process occurred stochastically or in specific lineages at different moments in the evolution of Glires. These observations suggest that the CCL16 had different evolutionary constrains in the Glires group that could be associated with the CCL16 biological function. Chemokines are small pleiotropic proteins of low-molecular weight with important roles in inflammation, homeostasis and immune response [1, 2]. Chemokines are only found in vertebrates and are classified according to their conserved N-terminal cysteine residues into CC, CXC, XC, CX3C and CX (only identified in zebrafish) [3, 4]. In CC chemokines, both N-terminus cysteines are juxtaposed. Chemokines are able to exert their function through the interaction between the residues located in both the extracellular loops and the NH2-terminus and the chemokine receptors [5–7]. C-C motif chemokine ligand 16 (CCL16), also known as liver-expressed chemokine (LEC) or human CC chemokine (HCC)-4, is located in the macrophage inflammatory protein (MIP) region of the CC cluster. CCL16 is a strong pro-inflammatory chemokine and a chemoattractant for monocytes and lymphocytes, enhancing their adhesive properties [8, 9]. Commonly present at high concentrations in normal plasma, CCL16 elicits its effects on cells by interacting with cell surface chemokine receptors such as CCR1, CCR2, CCR5 and CCR8 . In some mammalian species (human, mouse, rat, pig, cat, lion, European rabbit and domestic horse), CCR5 evolved under gene conversion with CCR2 [10–14]. In some, but not all leporid genera, the second external loop of CCR5 was altered by gene conversion with CCR2 [14, 15]. Indeed, the leporids European rabbit (Oryctolagus cuniculus), Amami rabbit (Pentalagus furnessi) and riverine rabbit (Bunolagus monticularis) CCR5 underwent gene conversion with CCR2, while cottontail rabbits (Sylvilagus spp.) and hares (Lepus spp.) have a normal CCR5. Since the second external loop is the target of chemokines, leporids are a good model to study the co-evolution of the chemokine receptors and their ligands . In order to determine the consequences of this CCR5-CCR2 gene conversion, the CCR5 chemokine ligands have been studied in leporids. The study of CCL8, a prime ligand of CCR5, revealed that this gene was pseudogenized only in those species that underwent the CCR5 alteration, while it remained intact in hares and Eastern cottontail (S. floridanus) [16, 17]. In contrast, CCL3, CCL4, CCL5 and CCL11 genes were found to be functional in all studied leporids [18, 19]. While in rabbit, mouse and rat CCL3 and CCL4 are encoded by a single functional gene, they are duplicated in other rodents such as squirrel and guinea pig, being either functional or inactivated [20, 21]. CCL14, which is more closely related to CCL16, is functional in the Leporidae family while in Ochotonidae some species present a disrupted gene . Interestingly, mouse and rat lack the CCL14 gene . Regarding CCL16, this gene is described to be pseudogenized due to different events in rabbit, mouse, rat and guinea pig [20, 23, 24]. The superorder Glires includes two orders, Rodentia and Lagomorpha, which diverged at approximately 82 million years ago (mya) . Rodentia is the most diverse among placental mammals with 2277 species within 33 families . Several phylogenies are proposed for rodents. According to Blanga-Kanfi et al. (2009), there are three main clades of rodents, the mouse-related clade, the squirrel-related clade and Ctenohystrica, that diverged ~ 73 mya. 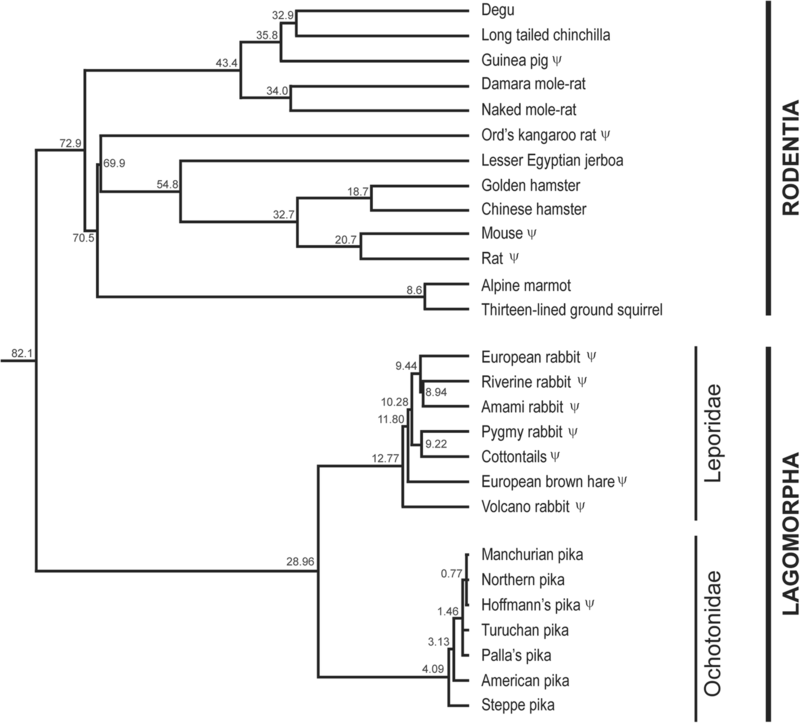 Lagomorpha includes two families, Ochotonidae (pikas) and Leporidae (rabbits and hares), that split at ~ 35 mya . The Ochotonidae family is composed of only one genus, Ochotona, which is divided into four subgenera, Pika, Ochotona, Conothoa and Lagotona . The Leporidae family comprises 11 genera Poelagus, Pronolagus, Nesolagus, Oryctolagus, Caprolagus, Bunolagus, Pentalagus, Brachylagus, Sylvilagus, Lepus and Romerolagus. To elucidate the evolution of CCL16 in the superorder Glires (rodents and lagomorphs), we sequenced the CCL16 gene in 11 Leporidae and seven Ochotonidae species. We compared the sequences obtained with the CCL16 sequences of 12 rodent species. Our results suggest that while functional in the Glires ancestor, CCL16 underwent pseudogenization stochastically or in specific lineages at different moments in the evolution of Glires. In this study, we genetically characterized CCL16 in lagomorphs. We further included the sequences available for several rodent species aiming at determine the evolution of this gene in the superorder Glires. 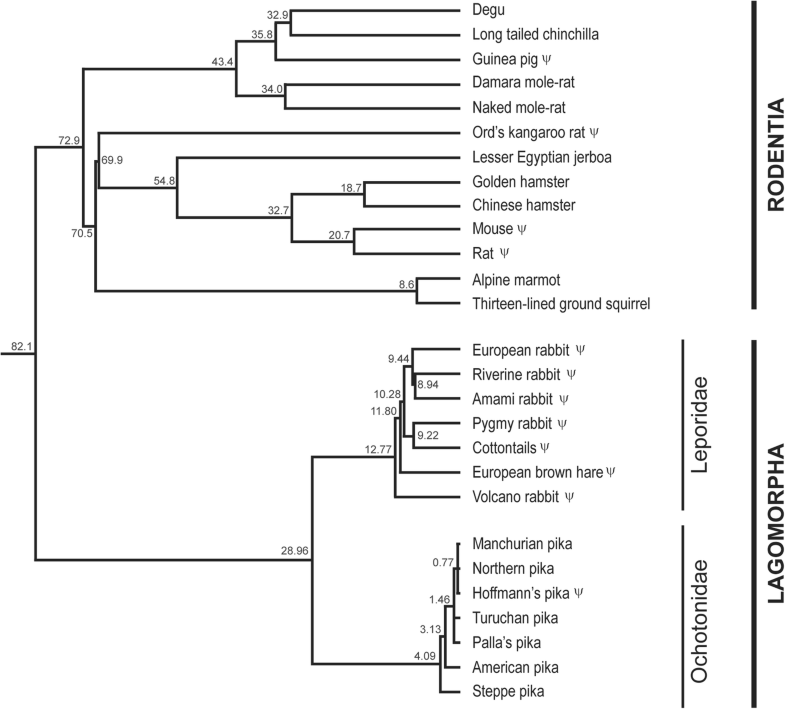 The European rabbit sequence available in public databases (XM_08271780.1) was predicted by computational analyses and exon 1 was quite different from the remaining mammals (primates, artiodactyls or American pika). Thus, we amplified the exon 1 for leporids using the exon 1 of these mammals for primer design (Additional file 1 and Table 1). In most leporids, CCL16 is a pseudogene due to a non-synonymous mutation (C > A) at codon 53 that leads to a premature Stop codon (TGC > TGA) and disrupts the juxtaposed cysteines (Cys53 – Cys54), typical of CC chemokines (Fig. 1a). Interestingly, in the Mexican, forest and Eastern cottontail rabbits, the Cys53 also presents a mutation, but it encodes a lysine (K). Despite this, all leporids studied present a frameshift mutation that disrupts exon 1 (Fig. 1a). 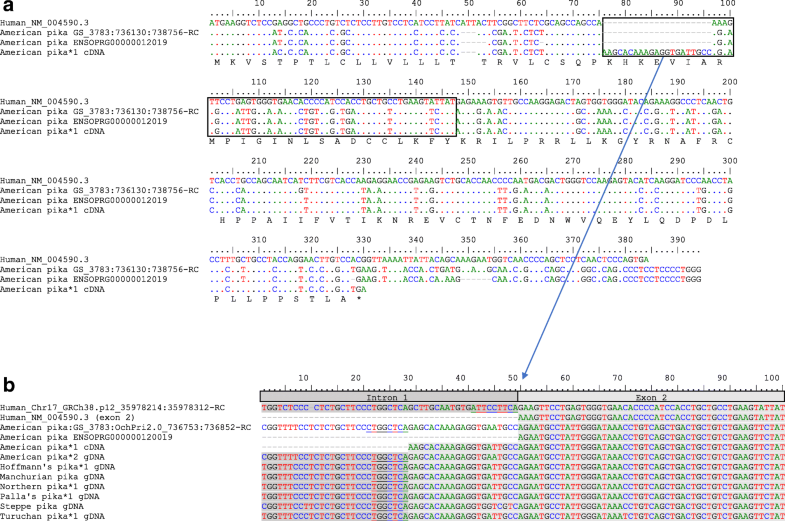 In addition, Mexican cottontail presents a deletion of 20-base pairs (bp) at the beginning of exon 2 (Fig. 1b) that leads to another frameshift. Other species-specific mutations that can lead to pseudogenization were also observed. Indeed, there are some single nucleotide deletions for pygmy rabbit (position 147) and for the Amami rabbit (position 276), and all leporids present a single mutation at position 393 (Fig. 1a). Other deletions are also observed for all leporids (Fig. 1a). In exon 1 (signal peptide), frameshift deletions that disrupt the sequence are detected for the European, riverine and pygmy rabbits and hares (16 nucleotides), and for the volcano rabbit and cottontails (19 nucleotides). Furthermore, pygmy and riverine rabbits present other mutations that lead to premature stop codons. These mutations occur in the pygmy rabbit at nucleotide position 283 (GAG (Glu) > TAG) and in the riverine rabbit at position 319 (AGA (Arg) > TGA) (Fig. 1a). All these deletions were probably due to independent events that occurred at different moments in the evolution of leporids, and are likely to be lineage-specific. Amplification of CCL16 from gDNA of the Amami rabbit also revealed an insertion of 24 nucleotides at the end of the second exon (from position 343 to 366) (Fig. 1a). In the Ochotonidae family, with the exception of Hoffmann’s pika, CCL16 seems to be functional (Fig. 2). In Hoffmann’s pika, CCL16 encodes one functional allele, while the other presents the same mutation in the CC motif observed in leporids (Fig. 1a). Interestingly, some rodent species have a functional CCL16 while in others it is pseudogenized, however due to mutations different than those described for lagomorphs. We successfully amplified the American pika CCL16 from both cDNA and gDNA. The American pika sequence obtained from cDNA presented some differences when comparing with the sequence available in Ensembl (ENSOPRG00000012019; Fig. 3a). Indeed, it presents several indels and misses the stop codon, suggesting a non-functional CCL16. Our gDNA and cDNA sequences are in agreement with the American pika genomic sequence available in Gene Scaffold_3783:736130:738756:1, and seem to be functional, despite presenting an insertion of 21 nucleotides, that correspond to an insertion of seven amino acids, at the beginning of exon 2. The complete sequence of the CCL16 gene (three exons and two introns) showed that this insertion derives from intron 1 (Fig. 3b) and might have resulted from the emergence of an alternative splicing site in the American pika CCL16 gene. This alternative splicing site occurs in a CA motif located in the intron 21 bp upstream of the CA motif that immediately flanks the exon 2 of the human CCL16 gene. These results were further confirmed by comparing the human and American pika CCL16 gene sequences in NetGene2. Indeed, for the American pika, NetGene2 predicted that the splicing occurs at nucleotide position 28 while in human it corresponds to nucleotide position 49 (according to the human sequence; Fig. 3b). The remaining pikas also present an alternative splicing site at the same position as observed for the American pika. In order to evaluate the evolutionary rates among Glires, we performed a Tajima relative rate test  where the CCL16 pseudogenes and non-pseudogenes (taxon B) were compared against other Glires with a functional CCL16. The Homo sapiens CCL16 sequence was used as outgroup. Our results (Table 2) show differences among these species, with pseudogenes presenting significantly higher number of nucleotide differences. CCL16 is a pseudogene in the European rabbit and in some rodents such as mouse, rat and guinea pig, but it seems to be functional in squirrel . Our results showed that, as previously observed for the European rabbit, in the riverine rabbit, Amami rabbit, pygmy rabbit, European brown hare, Iberian hare, volcano rabbit, Mexican cottontail, Eastern cottontail and forest cottontail, CCL16 is a pseudogene. We hypothesize that the Cys > Stop codon mutation appeared in the ancestor of leporids and reverted into a lysine in the cottontail branch at ~ 9.2 mya. Furthermore, there is a frameshift deletion at exon 1 in leporids that disrupts the sequence. Additionally, there are also other mutations originated from different pseudogenization events. The complete cDNA sequence of the American pika CCL16 gene showed an insertion derived from intron 1 that might have resulted from the emergence of an alternative splicing site. Human chemokines CXCL12, CCL4, CCL20, CCL23 and CCL27 also exhibit alternative splicing, leading to novel and functional proteins . Alternative splicing is a crucial step in the mature mRNA production  and leads to protein diversity, being the major source of protein complexity in the immune system . It occurs most frequently by exon skipping, mutually exclusive exons, alternative promoters or multiple polyadenylation sites, and alternative 5′ or 3′ spliced sites, and less frequently by intron retention [32, 33]. In the Ochotona spp. CCL16 gene, alternative splicing seems to have occurred by intron retention, but its biological meaning remains to be determined. For pikas, we observed that, with the exception of Hoffmann’s pika, the CCL16 gene seems to encode a functional protein. Interestingly, in Hoffmann’s pika we identified two alleles, one corresponding to an intact gene and the other, similar to leporids, presenting a mutation in the Cys53 that leads to a premature stop codon. The similarity with the pseudogenization process observed in leporids suggests that this region may be prone to mutations. This is at odd as this site is important for disulfide bond formation, and thus alterations in this motif may alter protein structure and, consequently, its function. CC chemokines are characterized by two juxtaposed cysteines that in CCL16 correspond to amino acids 53 and 54 of the mature protein (Fig. 2). The loss of one of these cysteines due to a mutation that encodes a premature stop codon leads to inactivation of this chemokine. Moreover, the mutation into an amino acid different than a Cys most likely impairs the protein to exert its functions. This is the case for all leporids studied and one allele of Hoffmann’s pika. The presence of the same mutation in the two families of the order Lagomorpha might be explained by parallel evolution in the different lineages such that the same mutation occurred independently at different time points in the lagomorphs’ evolution. Alternatively, this Cys - Stop mutation was already present in the lagomorphs’ ancestor and was later “distributed” stochastically, with some species presenting the stop mutation whilst others do not. Considering that in rodents some species encode a functional CCL16 and in others CCL16 is a pseudogene , we retrieved the available rodent CCL16 sequences from public databases (NCBI, Ensembl and UniProt). We observed that besides mouse, rat and guinea pig, CCL16 might also be a pseudogene in the Ord’s kangaroo rat (Fig. 1). In these species, CCL16 is a pseudogene due to different mutations. Mouse CCL16 has been reported as a pseudogene due to mutations that lead to the loss of the characteristic juxtaposed conserved cysteines and an insertion of a Long Interspersed Element–1 (L1) in the third exon . As for rat CCL16 [20, 24], there is no further information on what led to its pseudogenization and no sequence is available in the public databases. For the Ord’s kangaroo rat and guinea pig, CCL16 is a pseudogene due to premature stop codons at nucleotide positions 282 and 397, respectively. In the remaining available sequences, CCL16 seems to encode a functional protein (Fig. 2). The mutations observed in different rodents’ lineages may indicate that the CCL16 gene was functional in the rodents’ ancestor and became later pseudogenized (Fig. 4). Indeed, we observed that Muridae (mouse and rat), Heteromyidae (Ord’s kangaroo rat) and Cavioidea (guinea pig) have a pseudogenized CCL16 gene while in members of the Sciuroidea (thirteen-lined ground squirrel and alpine marmot), Cricetidae (Chinese and golden hamsters), Dipodidae (lesser Egyptian jerboa), Bathyergidae (naked mole-rat and damara mole-rat), Chinchilloidea (long tailed chinchilla), and Octodontoidea (degu), it is intact. Thus, the CCL16 pseudogenization also occurred stochastically along the Rodentia order. The Tajima relative rate test results rejected the null hypothesis, clearly showing that the CCL16 pseudogenes are evolving faster than the non-pseudogenized CCL16 genes, providing further evidence of an ongoing pseudogenization process in the Glires clade. Usually, a gene is lost when it is removed from the genome or when it is still in the genome but with no functional role due to deleterious mutations (frameshift, deletions, insertions, early stop codons) . The Black Queen Hypothesis  argues that the loss of a gene, although being deleterious, can be beneficial to the organism, mostly when related to pathogen resistance, being a pervasive process in all life kingdoms [34, 36]. Examples of this hypothesis are the resistance to acquired immunodeficiency syndrome (AIDS) and malaria in humans with mutations in the CCR5 and in the atypical chemokine receptor 1, respectively [34, 37]. In vertebrates, the number of chemokines varies among species , being characterized by the promiscuity of ligand-receptor binding and also by their chromosomal location and similar gene structure . CCL16 is located in the MIP region of the CC cluster, which is important for immune cells recruitment , and is described in close vicinity of CCL5, CCL14 and CCL15 [20, 24]. Previous studies showed that, similar to CCL16, CCL14 is a pseudogene for some lagomorphs while functional for others . Interestingly, CCL3, that is also located in the MIP region and is a pseudogene in some species (human, rat, mouse, guinea pig), presents in the same region genes with similar structure and function, called CCL3-like genes . This raises some hypotheses: CCL16 loss in some rodents and leporids may be beneficial to these species (Black Queen hypothesis); the CCL16 functions’ may be replaced by other genes; some CCL16-like genes might be present in the genome. Additionally, we may speculate that the MIP region itself may be prone to gene loss events, being quite divergent among species . Overall these results suggest that in Glires (rodents and lagomorphs), CCL16 suffered several independent pseudogenization events, with some species presenting one or both alleles disrupted. Thus, although CCL16 was functional in the ancestor of the Glires clade, it became inactivated in some lineages. This may have occurred stochastically or in certain lineages at different times in the CCL16 evolution, and could be associated with the CCL16 biological functions. Genomic DNA was extracted according to the manufacturer’s instructions using the EasySpin Genomic DNA Minipreps Tissue Kit (Citomed, Torun, Poland) from tissue samples of European rabbit (Oryctolagus cuniculus cuniculus and O. c. algirus), riverine rabbit (Bunolagus monticularis), Amami rabbit (Pentalagus furnessi), pygmy rabbit (Brachylagus idahoensis), Mexican cottontail (Sylvilagus cunicularis), forest cottontail (S. brasiliensis), Eastern cottontail (S. floridanus), European brown hare (Lepus europaeus), Iberian hare (L. granatensis), volcano rabbit (Romerolagus diazi), American pika (Ochotona princeps), Northern pika (O. hyperborea), manchurian pika (O. mantchurica), steppe pika (O. pusilla), Hoffmann’s pika (O. hoffmanni), Palla’s pika (O. pallasi) and turuchan pika (O. turuchanensis). Ochotona samples were provided by Andrey A. Lissovsky, Zoological Museum of Moscow State University, Russia. The Sylvilagus brasiliensis sample was provided by Cibele Rodrigues Bonvicino, Instituto Nacional de Câncer (INCA), Brazil. The remaining samples were available in the CIBIO tissue samples collection. Approval from an ethics committee was unnecessary since no animals were killed for the purpose of this study and these samples have been described and used in previous publications [15, 19, 22, 39–41]. Total RNA was extracted from liver tissue of one specimen of American pika by using the RNeasy Mini Kit (Qiagen, Hilden, Germany) according to the manufacturer’s instructions. RNA quality, integrity and concentration (Table 3) were measured using NanoDrop. Further, RNA samples were ran into an agarose gel (0.8%). cDNA was synthesized according to the manufacturer’s instructions by using a total of 1 μg of RNA, oligo(dT) as primers and SuperScriptIII reverse transcriptase (Invitrogen, Carlsbad, CA, USA). 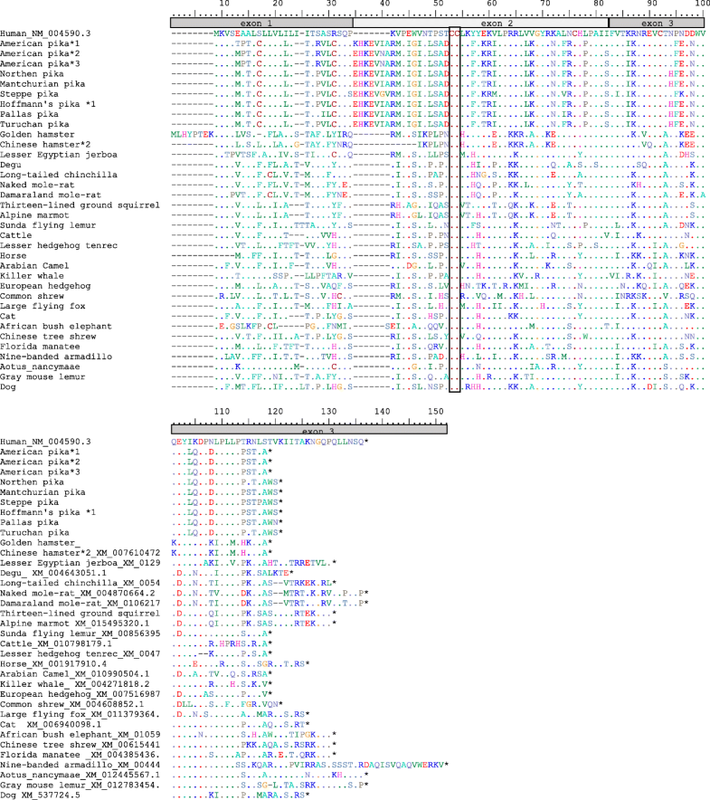 The American pika (ENSOPRG00000012019) sequence available in Ensembl was used for primer design (Table 1), while for the European rabbit, we used the alignment of several mammalian CCL16 sequences (Additional file 1 and Table 1). PCR amplification from gDNA was performed by amplification of several overlapping fragments with Multiplex PCR Kit (Qiagen, Hilden, Germany), according to the manufacturer’s protocol. Sequencing was performed on an ABI PRISM 310 Genetic Analyser (PE Applied Biosystems) and PCR products were sequenced in both directions. Sequences were submitted to GenBank under the following accession numbers: MK305131-MK305156. The sequences obtained were aligned with other CCL16 sequences available in GenBank. For Rodentia, all available sequences were used along with CCL16 sequences from the most representative mammalian orders (e.g. Primates, Artyodactyla, Carnivores, etc). Sequences were aligned using MUltiple Sequence Comparison by Log-Expectation (MUSCLE) available at http://www.ebi.ac.uk/  and translated using BioEdit . Splicing sites were predicted by using the NetGene2 server available at http://www.cbs.dtu.dk/services/NetGene2/ [44, 45]. The Tajima’s relative rate test  was conducted in MEGAX  in order to understand the evolutionary rate of Glires CCL16 and its statistical significance. We used CCL16 pseudogenes and non-pseudogenes as taxon B; for taxon A, species other than Degu (Octodon degus) were used. However, since similar results were obtained, only the results for Degu are presented. The authors would like to thank Cibele Rodrigues Bonvicino, from Instituto Nacional de Câncer (INCA), Brazil, and Andrey A. Lissovsky, from Zoological Museum of Moscow State University, Russia, for providing tissue samples. This article is a result of the project AGRIGEN – NORTE-01-0145-FEDER-000007, supported by Norte Portugal Regional Operational Programme (NORTE2020), under the PORTUGAL 2020 Partnership Agreement, through the “European Regional Development Fund (ERDF)”. Fundação para a Ciência e Tecnologia (FCT) supported the Post-doc Grant of A.M. Lopes (SFRH/BPD/115211/2016) and the FCT Investigator grants of P.J. Esteves (IF/00376/2015) and J. Abrantes (IF/01396/2013). L.A. Fusinatto was supported by the postdoctoral fellowships from FAPESP, process number 2013/21174–7 and 2015/11557–1, and FAPERJ, process number E26/202.775.2016. All sequence data except those produced in this study were obtained from GenBank database of the NCBI platform or Ensembl. The GenBank accession numbers of nucleotide sequences used in this study are shown in Figures and/or Figure Legends. Sequences produced in this study were submitted to GenBank and the following accession numbers assigned: MK305131-MK305156. FN and PJE designed the experiments. FN performed the evolutionary analysis. FN, PJE and JA wrote the final version of the manuscript. The laboratory work was performed by FN, AML, LAF and MJM. WVDL helped interpreting the data and revised the manuscript. All authors have read and approved the final version of the manuscript. Morris JJ, Lenski RE, Zinser ER. The black queen hypothesis: evolution of dependencies through adaptive gene loss. MBio. 2012;3(2):e00036-12. https://doi.org/10.1128/mBio.00036-12.